The following comes from a Jan. 11 release by the Diocese of Sacramento. In the new evangelization, the church teaches “meeting people where they are.” Increasingly, mobile devices are where people are. We have so much information in our hands, so how can we ensure that faith is at the fingertips? Enter the MyParish app. On January 12 and 13, parishes across the Diocese of Sacramento hosted “download Sunday” to officially introduce the MyParish app to all parishioners. 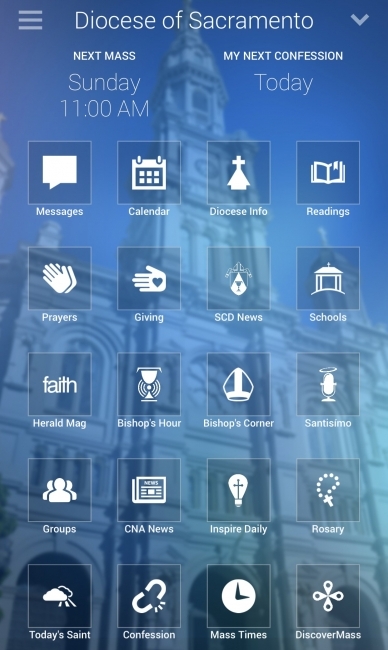 The MyParish app, developed by Diocesan Publications, is offered free of cost. The app allows you to stay up to date with events and messages from your parish. Access daily readings, reflections, and prayers to help you live Catholic life every day. You can schedule daily or weekly notifications to pray or schedule a reminder to go to confession. There’s even an interactive examination of conscience built right into the app. You can “favorite” multiple parishes and receive messages from each. This is a great feature for retirees or families that frequent each other’s parish communities. Turn on “Mass mode” and you’ll get a notification 20 minutes before Mass to silence your phone. To download, text the word “app” to 88202 or search for MyParish app in your app store. I think this enamoration with technology by the church is misguided. Instead of having worthy, reverent worship and relevant, substantial catechesis there’s a push to have facebook, apps, streamed content. Celebrate Mass worthily, have interesting and meaningful catechesis, and a parish will flourish and more importantly people will grow spiritually. But that requires hiring competent musicians and teachers, which requires paying them well. Instead, most parishes have mediocre at best staff. Personnel is policy. Apps are a waste of time and money. The bishop who did this doesn’t understand what people want from the church nor what will make the church thrive. For me, personally, and for my family — the modern world is too alien! The “Death Culture” is also completely alien– a horrible thing! But there are a great may souls out there, in need, who may be successfully reached by the Catholic Church– with acceptable and appropriate forms of modern technology. More than anything– we need the Pope and bishops to all be unified in living by and teaching authentic Catholic Faith and Morals, to be good practicing Catholics, and to properly lead all of us. With an excellent, reverent Mass, and religious devotions. (No “freedoms” to be corrupt, irresponsible, immoral– and mislead the people!) Salvation– (Heaven!) — with Christ– is our only goal! Bishop Soto provides a great tool for today’s parishioner. He fully understands what people want in this information age. Only a few people read newspapers anymore. People are on their “devices” most of the time. If you want to reach them, you reach them on their devices. In today’s world, if you are not online, you don’t exist. I know there are people who still don’t have a smartphone, or see the need for one. That’s ok. But what about the other 90%? To evangelize well, you must meet the people where they are. Today, that is online. Yes, most parish staff are poorly paid. That being said, what’s wrong using current technology to help the faithful better practice their faith? Sure, this won’t overcome an irrelevent, irreverent, poorly delivered homily or other issues. Cart before the horse. Appearance of doing something meaningful or effective while neglecting first things. A couple years ago it was formed.org that was being touted as reaching out to Catholics online, but that’s been a dud. Then Word on Fire joined the bandwagon with its parish online/connectivity/app/email subscription plan, but that’s fizzled too. All trying to be the Catholic Netflix or Facebook but not seeing that the medium isn’t the message nor is technology/connectivity a substitute for substance. If we want to bring people to church or bring them back to church, the first thing we must do is remind them that there is a church, that it is easy to find, get to, and that people are welcome. You have to go to them if you want them to come to you. Secondly, don’t worry if some program doesn’t work. Try another one until one does work. Each parish is different and will need a different program. Thank you Bishop Soto. I also enjoy watching the TLM on my iPad. I honestly don’t understand how anyone could be against a tool that helps brings people closer to Christ and her church. Most Catholics–even the most devout–spend their waking hours outside of Mass. This is a great tool for people to utilize on their spiritual journey. This has some limited usefulness, but it’s not the big deal that the diocese is making it out to be. At least it’s not as dumb as the pope’s new “click to pray” app. Sheesh. When will the bishops stop trying to be hip and faddish and do the real work of the church? These apps are going to make prayer as superficial, perfunctory and meaningless as clicking “like” on facebook. Just like people think they have meaningful friendships when most of them are fake facebook friends, people will think they have meaningful spirituality when all they’ll have is fake app spirituality. These apps are dangerous in that they can make people think going to church isn’t necessary anymore because they can pray by swiping or clicking. Meaningless.